- Whoever is interested in posters and their distribution in their area, and therefore helping the project Radio Rescue to be known better, please write an email to Radio Rescue (email address at the end of this article). It is not possible to indicate the exact price because we send many orders to a big printing house that determines the price according to the number of pieces ordered. Then the price given by the printing house is divided equitably according to the ordered pieces and format. - Whoever has the possibility to print these posters/flyers by himself; here are samples of the posters/flyers and also a link to download them in the required size and quantity. We have processed these versions in the output format "CMYK", which is necessary for big printing houses: Slovak version of the "blue" flyer - A4, A5; Slovak version of "black" flyer - A4; Hungarian versions of both flyers in A4 format. If you are interested, please contact us and we will be glad to provide them for you. 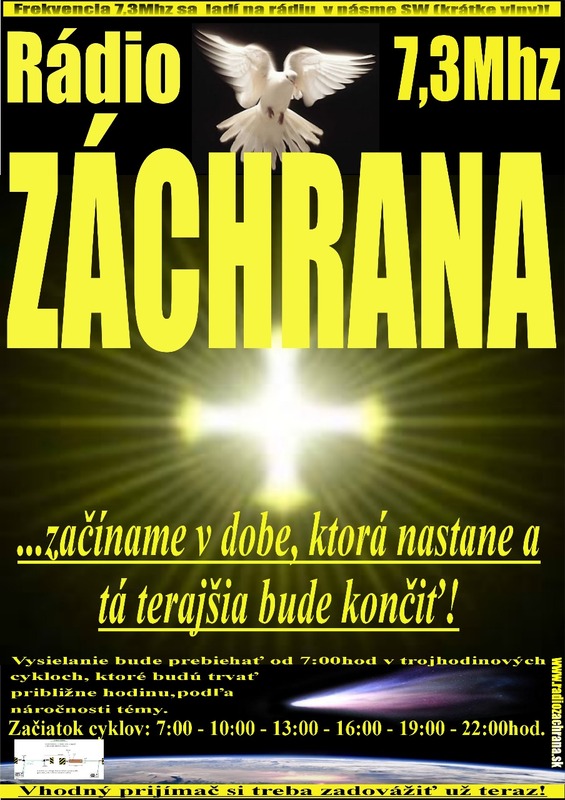 “www.radiozachrana.sk”; “www.radio-rescue.com”; “www.radio-megmentes.webnode.sk”. The price of the sticker in size 60x4,5 cm is around 2,75 € + postal charges. We can produce the sticker in different sizes as well. Also there is a possibility to produce the sticker with logo of Radio Rescue, which you can find here below. The price depends on the size of the sticker and is bartered individually. - If you have the possibility to spread the information about the Radio Rescue in your area in some other way, we will be very happy if you do so, whether with our help (contact address is here below) or by yourself. - There is the possibility to translate the texts – broadcasts for the people who speak foreign languages (Hungarian, German, Polish, Italian, Russian ...). - Those who don´t speak any foreign language, they can produce new broadcasts in Slovak language. But to do that, it´s necessary to have at least the basic technical equipment – the recording device and computer or other device, which is able to process the record. We would be glad to provide the appropriate and available program, as well as the basic instruction to use it, for you.